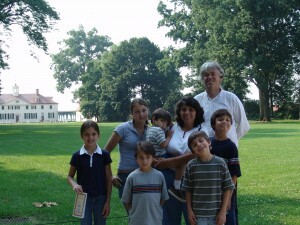 In the summer of 2004, we took all the kids back East to see Boston, Concord, Gettysburg, Mt. Vernon, and Williamsburg. Do I have contempt for their position? Yes. I count my children as monumental blessings, and it’s very difficult for me to fathom people who have such hatred for family life — and children. Do they have contempt for mine? Obviously. But are we really going to shut down freedom of expression over this? Is their position so incredibly fragile they must demand absolute affirmation? They can’t take a critique? They can shout “breeder,” but we can’t shout “barren branch?” Are we really going to allow them to define a rebuke about sexual immorality with outright Westboro Baptist blind rage? Will we allow them to define what can be discussed and what can’t? Every day I see greater proof of God’s wisdom in this. I can allow them to rant and rave and have tantrums because I know they’re wrong. They can’t abide either an insult or a rebuke, because they fear they are wrong. The fear is so palpable, they will scream if you get anywhere close to a reservation about their choices. In either case, are we really going to declare a police state on expression over this? At some point, you have to decide whether you believe in the first amendment or not.